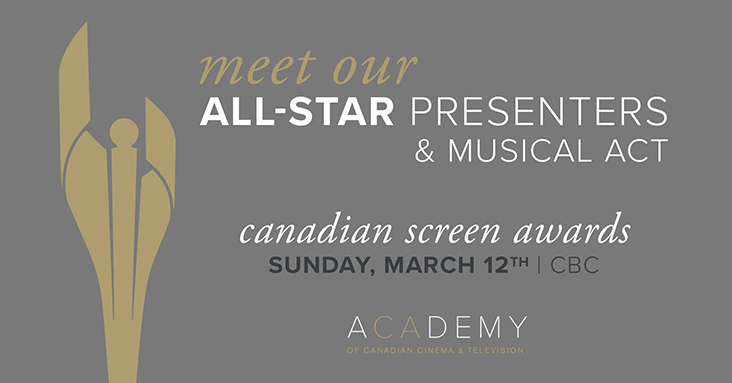 TORONTO | MONTREAL, February 14, 2017 – The Academy of Canadian Cinema & Television and CBC today announced the first group of celebrity presenters for the upcoming 2017 Canadian Screen Awards. This year’s gala will be hosted by Emmy Award-winning comedian, actor and television personality Howie Mandel at Toronto’s Sony Centre for the Performing Arts and broadcast live on CBC on Sunday, March 12, 2017 at 8 pm (9 pm AT; 9:30 pm NT). Presenters for the evening are some of Canada’s most notable stars (in alphabetical order): Arisa Cox (Big Brother Canada), Atom Egoyan (Remember, Sweet Hereafter), Catherine O’Hara (Schitt’s Creek), Catherine Reitman (Workin’ Moms), Daniel Levy (Schitt’s Creek), Eugene Levy (Schitt’s Creek), Jean Yoon (Kim’s Convenience), Kim Coates (Goon: Last of the Enforcers, Bad Blood), Paul Sun-Hyung Lee (Kim’s Convenience), Rick Mercer (Rick Mercer Report), comedian Seán Cullen, Stephan James (Race), Tatiana Maslany (Orphan Black, The Other Half) and Wendy Crewson (Room, Saving Hope). In addition, the night will feature a performance by breakout music sensation Francesco Yates. Additional presenters will be announced in the coming weeks. Canadians can watch these stars and more at the 2017 Canadian Screen Awards, airing Sunday, March 12, 2017 at 8 pm (9 pm AT; 9:30 pm NT) on CBC. Click here for a full list of 2017 nominees.